Dostoyevsky said: ‘They always say that art has to reflect life and all that. But it’s nonsense: the writer (poet) himself creates life such as it has never quite been before him...’. For the Merjans, there are no gods — only Love and Water. These small greenish-yellow birds found almost everywhere in Russia usually go unnoticed. Yet experts often compare them to canaries that would have learned to sing. This title sequence already gives clues that we’re in a kind of fairy tale. The storyteller, whose face we haven’t seen, carries us through the forest on a path we do not know, making strange of the ordinary, drenching us in the “once upon a time” of the here and now. With his bicycle he crosses a river on a floating bridge that bobs on pontoons and sways with the water. Our narrator goes on to tell us that the Merjans themselves are strange, impassive but capable of sudden affections. Promiscuity for them is a like a custom or rite — no one remembers why. But this man, Aist (an “obviously Merjan” name), wants to find out why his people are the way they are, so he is collecting snatches of songs, names, words. Like an ethnographer, he traces his culture, and it doesn’t always come easily. His father, a local poet, told him, “If your soul hurts, write about the things you see around you.” While Aist’s wall is covered top to bottom with photographs of buildings, streets and fields, animals — a virtual panorama of the life outside his window — his home interior bizarrely reveals bunting colors, the pale yellows and grays and tans of his curtains, tiles, and furniture curiously echoing the speckled feathers of the birds as the panning camera lands on their out-of-focus forms. The connection doesn’t stop there. Aist is by profession a photographer at a paper mill, and in the next scene — a montage of flash frames as his camera “documents” one young female worker after another — he is summonsed to the factory head’s office, decorated with a huge mural of the industrial complex. Miron, his employer, ushers him up to the roof where the two share a drink of shadberry liquor. In the peculiar vertical shot of them from above as they climb a ladder enclosed in a narrow cage, they might as well be ascending the “staircase to heaven.” At the top Miron enlists Aist, clearly his close friend, to help him bury his newly deceased wife in the traditional Merjan way. This solemn process is performed in all its essential and surprising detail. 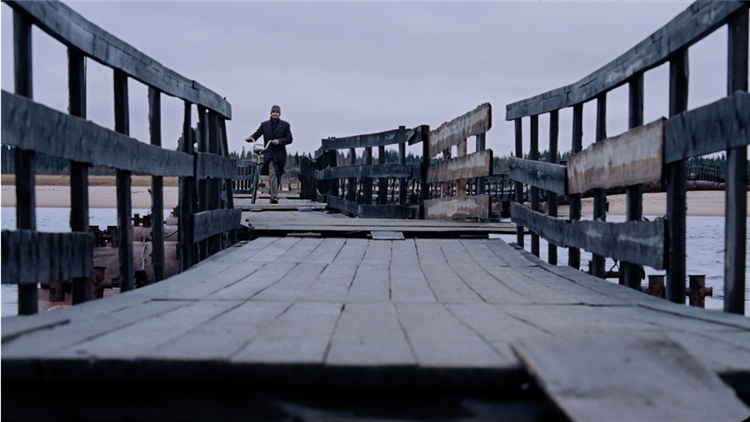 The low, slow chant of voices that could be the sober lament of Volga boatmen sets the tone on the soundtrack as the two men head out to Miron’s home. Rain gathers on the car’s windshield. The buntings chirp in their cage beside Aist as a number of people carry a long canoe across the road. Miron cleanses his wife’s naked corpse and both men decorate her the way maidens would a bride before her wedding. The music swells with lively celebration as we see such a preparation in flashback — or is it rather a “demonstration” for us of the Merja custom? Then the men and the deceased depart for the place where Miron and Tanya spent their honeymoon. There they will build a funeral pyre on the beach, burn her body, and “commit” Tanya’s ashes to the water. The subtle movement of the camera that accompanies this reflection, a 180-degree pan inside the car from the front window to the rear window, is equally significant: it’s a visual rhyme for the words uttered by Aist, particularly the repeated phases. Furthermore, this panning movement echoes the jump-cut early in the film of Aist (we now surmise) on his bicycle returning home with the buntings he has just acquired. Now the camera again fixes its point of view (out the rear window) on the empty road, its puddles under low-hanging clouds ready to burst on bare trees. Again, we don’t know where we’re headed; we can only see what we’re leaving (and even those leaving it have left our screen). Similarly, the next scene offers another fluid tracking shot, this time on the water, of a yellow-haired boy in a boat being rowed by someone off-screen, in that same position below our frame as in earlier scenes on wet roads, and the brilliant gold lighting of the scene removes us to another time, a nether-world bathed in calm and peace. Then strangely, the film cuts to the inside of Miron’s car. He has left it, followed by Aist, to gaze at the water’s edge. The point of view appears to be Tanya’s, from the back seat — or does it belong to the yellow-speckled buntings as they chirp and flit within their cage? Tanya’s maiden name was Buntinkina and Miron called her “bunting” when they were young. Now, as it has turned out, the birds accompany her in the car and they often occupy the center of the frame. Part of the ritual of saying good-bye to a deceased wife includes “smoking” about her to those with whom one is intimate, and Miron pours out his feelings for Tanya to Aist at this moment, when it is proper until her ashes are delivered to a body of water. There is the tacit suggestion in Aist’s reaction that he is also the best ear for such “smoke,” that indeed Miron may have chosen him to share the ritual because Aist had a similar bond with Tanya. When her body is aflame in the funeral rite, two buntings light on the branch of a tree, a shot juxtaposed with the two men standing side-by-side at the burning pyre. “Water is the dream of every Merjan. Drowning means to suffocate from joy, tenderness, and yearning,” Aist tells us. If they find someone drowned, they tie a weight onto the body and give that person back to the water. The water replaces that body with a “new flexible one, able to transform.” So death by water is immortality for a Merjan — and also mutability. When Aist’s mother died in childbirth, they committed her and his stillborn sister to the water, and in grief, Aist’s father dreamed of drowning, but the Merjan don’t drown themselves, Aist tells us. “It’s impolite to rush to heaven, passing by the others. The river chooses people herself. The water is the highest judge.” Aist’s father died of sorrow. As Silent Souls continues, its tale grows increasingly surreal: a natural physicality and an imaginary point of view exist as one. Aist tells us he and Miron got lost on their way back to Neya and ended up in Molochai — “It’s a shame this town doesn’t exist any more.” Yet we see its old palace through the fog. Then we see the two men shopping in a warehouse store. Aist picks up a kind of periscope, peering through it, Miron smiling. They look at washing machines. Later they watch skaters glide upon an ice rink. Then in the car again, they are given a detour and find themselves back in the same place where they left Tanya. Upon seeing this film, it’s easy to want to know more about the Merja. What were their other values, rituals and practices? We drink in the “ethnographic” detail of the first ten minutes touching on history, geography, rituals, beliefs — or is it simply that we take account of the information as such, needing a label for the Merja, fixed points of reference, a way of classifying them (and therefore, us). They are already marginal — even exotic — in their near extinction as a visible culture, although they bear some kind of a secret insignia that allows them to recognize each other and communicate in their own arcane language of signals and customs. But our own research doesn’t get far before we learn that their portrayal in the film is fictitious. Anyone lucky enough to have seen Fedorchenko’s earlier work is not surprised. First on the Moon, a beguiling account of an unknown 1930’s conquest in space for the USSR, won the Venice Horizons Documentary Award, though it is a feature-length fiction film. It reveals itself as a mockumentary of the highest order: packing a vault of detailed knowledge into a stunningly convincing (and biting) cinematic presentation, the writer-director wowed international festival audiences in 2005 with this heroic “victory” in Soviet “history.” Having worked in an early career as a space science researcher, Fedorchenko has also managed Sverdlovsk Studio’s production department, overseeing more than 80 films in the last decade. With expertise, experience, and access to resources, why make a mockumentary? Fedorchenko does it not for the sake of playfulness (though he is exceedingly good at that, and at the same time amazingly knowledgeable of his subject matter) but so as to position the viewer to raise questions (not to get answers), perhaps about Russia and its future but certainly about “facts” and “fictions,” art and truth, and works of cinema as “documents” of our times. Are not all of these invented, created, shaped at every moment? Just as Osokin is taking his place in contemporary Russian literature, Fedorchenko is joining the cohort of post-Soviet film auteurs who have worked their ways up through the ranks of the industry to offer fresh visions and voices to Russia’s cinema culture. Gaining in international visibility over the last decade, filmmakers such as Andrei Zvyagintsev, Valery Todorovsky, and Alexei Popogrebsky, for example, have each found singular ways to reflect upon Russian men at this moment in the country’s history, within traditions of masculinity, male prowess, and “progress.” Each of these artists has investigated the losses of men and boys and the ways that they mourn them, at once yearning for something different or new. Zvyagintsev has probed the “family” (in the small sense and the large sense) and the role of the father “through a glass darkly,” as it were (though his recent Elena might start to reverse this trend); his director of photography for both The Return (2003) and The Banishment (2007), Mikhail Krichman, shot Fedorchenko’s Silent Souls. Beginning with The Lover (2002), Todorovsky has portrayed the extent of men’s capacity to bond emotionally or even share compassion or understanding, especially regarding the same woman, deceased; My Step-Brother Frankenstein (2004) created a mysterious and pointed portrait of fathers and sons in relation to outlying republics, and Hipsters (2008) directed the inquiry to Russia’s youth cultures. In 2003 Popogrebsky and Khlebnikov depicted a boy’s sense of loss in a father who was there but not “present” in the exquisite road film, Köktebel; the angst continued between men in Popogrebsky’s How I Ended This Summer (2010). The women in these films, especially wives and mothers, are significantly absent, and the men are “in trouble,” left to sort things out, to see what went wrong, where to go and how to get there on roads with no maps. A few of these films pose remarkable alternatives, or at least alternate readings of history. This “wave” of males on the screen is indeed a relative one — relative precisely to Russia’s women, its composite cultures, old and new, and its neighbors near and far. Now we can consider in what ways Fedorchenko and Osokin might be riding with the current. As fluid as Silent Souls is in its mise en scène — a vast, directionless lattice-work of sodden land, low-lying lakes, and rivers running under rain clouds all the way to the horizon — and in its camera placement (sometimes as if below water level) and camera movement (with the grace of a spirit), the film more importantly posits an underlying theme of fluidity for today’s cultures. The dreamscape of Aist Sergeyev’s memory is less oriented to traveling ahead, arriving, than it is to looking beneath, behind, mourning the missteps, dwelling in the well of lost and missed loves, and building tentative, modest bridges in hope of connection. The roads taken by Aist and Miron, whether detours, circuits, or unmarked paths — all vital to their journey — lead them ultimately not to death but to immortality. Silent Souls, then, is less about the transition from life to death than it is about the experience of liminality that can take one from death to life. The voice-over, often employed in documentaries as the “voice of God” and therefore authority, is too seldom sensed as such by spectators, even of fiction films. The off-screen voice is over-used in narrative filmmaking as a shortcut or easy means and is thoughtlessly absorbed by the viewer. 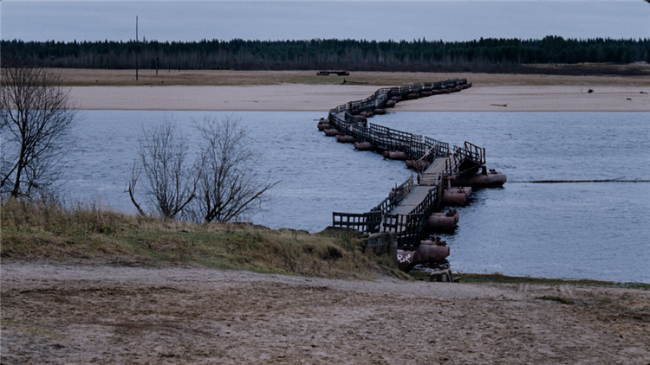 But in Fedorchenko’s film the voice displaces God, though it could be speaking from anywhere, even deep within a river or a lake, for example, the place where Tanya’s ashes were “committed to the water.” Here the disembodied voice is a perfectly apt strategy for imparting Aist’s personal and family history (the character, the narrator who ends up writing the tale with his father’s “silted typewriter on the sides of dead fish,” the author of the story “Buntings,” and the screenwriter of Silent Souls all go by the same name). That voice is also a lament for all those families and cultures and nations whose languages may have been silenced or whose traditions may have been derailed from their own circuits of expression and practice. Finally, the posthumous tale of Silent Souls may be seen as a revelatory ghost story, haunted by Russia’s pre-Orthodox past but also its post-Soviet present after nearly a century of a national identity awash with cultures swimming like fish in a vast sea of stories waiting to be told. Director: Aleksei Fedorchenko; Producers: Igor Mishin, Mary Nazari; Screenplay: Denis Osokin, based on the novel Ovsyanki by Aist Sergeyev; Cinematographer: Mikhail Krichman; Editor: Sergei Ivanov; Sound Editor: Kirill Vasilenko; Art Director: Aleksei Potapov; Costume Designer: Anna Barthuly; Composer: Andrei Karasyov. Cast: Igor Sergeyev, Yuri Tsurilo, Yuliya Aug, Ivan Tushin. Color, 35mm scope, 75 min. In Russian with English subtitles.